Six years ago when the IPL was first established, it was like a dream come true. It was the world's best cricketers and the world's biggest stars coming together, it was cricket and bollywood entertainment combined into one extravagant package. For a fan like me, it didn't get better than that. It was entertainment at its best. For the first time this year, IPL came to my town. It came to Abu Dhabi, Dubai, and Sharjah, the place I grew up watching India vs Pakistan matches. Thanks to a friend, I got my hands on two passes for the Super Saturday IPL matches: Rajasthan Royals vs Royal Challengers Bangalore and Kolkata Knight Riders vs Kings XI Punjab. It was going to be a day where I could watch Virat Kohli, AB De Villiers, Yuvraj Singh, Shane Watson, Mitchell Johnson, Jacques Kallis, Virender Sehwag, Gautam Gambhir, and the big show Glenn Maxwell live in action! And then there was the prospect of Shahrukh Khan, Preity Zinta, and Shilpa Shetty being there. The cricket itself was quite boring. The Royal Challengers were bowled out for 70 odd and Rajasthan Royals took their sweet time to get there. Punjab were bowled out for 133 and KKR could manage only 109. I saw only half a dozen sixes being hit throughout the day, and the highest score by a batsman was 37 by Sehwag. Maxwell, Kohli, Watson, Kallis... no one got going. 1. 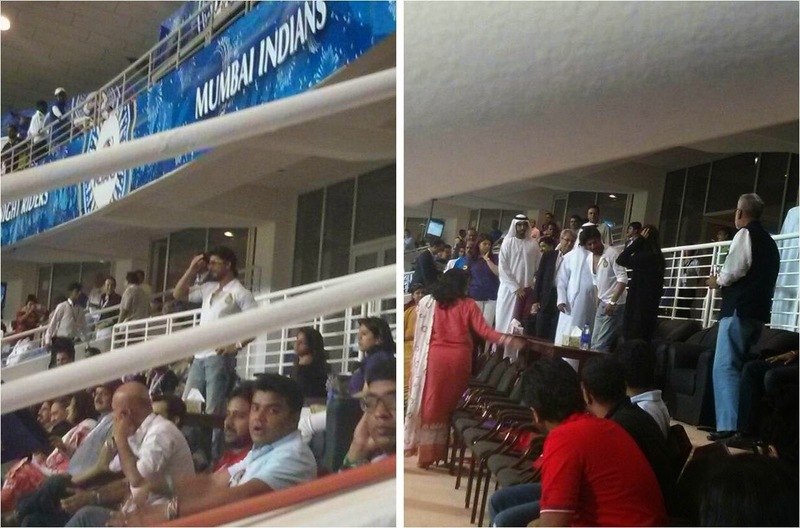 Vijay Mallya's box was right behind where we were seated, while Shilpa Shetty was seated a few boxes away. 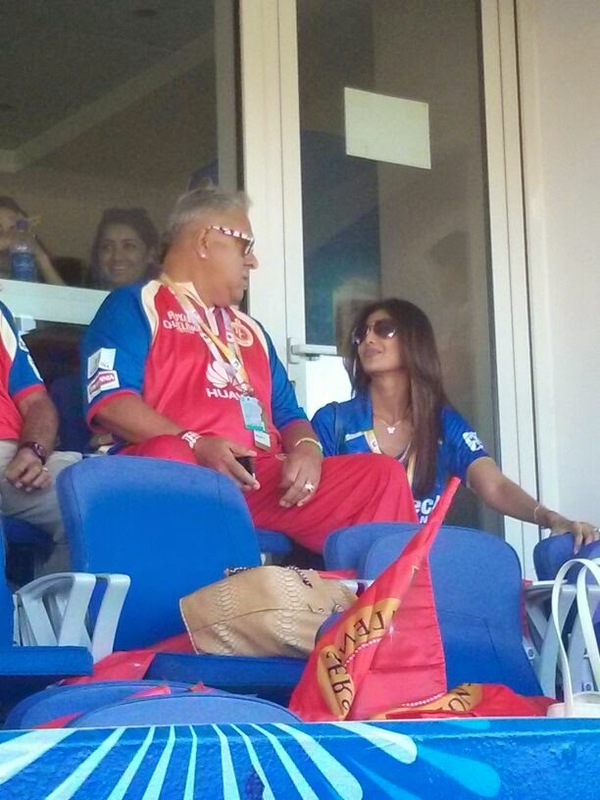 Between the two innings, Shilpa Shetty paid Mallya a visit, and the crowd around us went ballistic. They merrily clicked away as the security had a tough time controlling people standing at the edge of Mallya's box. 2. Once the first match ended, the Punjab and KKR teams took to the field for some drills as the presentation was ongoing. At the end of the presentation, Shane Watson walked up to greet his Australian mates who were part of the Punjab XI - Bailey, Maxwell, and Johnson. They chatted for a good 10 minutes; your guess is as good as mine regarding what they chatted about. 3. A representative from KKR came into the crowd and distributed KKR hats and flags to everyone. 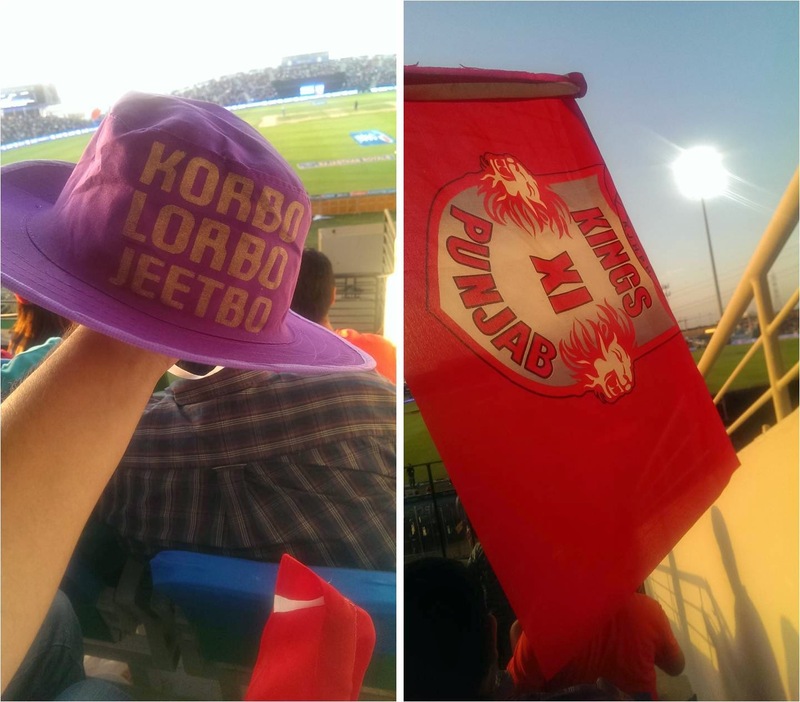 15 minutes after he left a rep from the Kings XI came there and announced that whoever gave him the KKR flag or hat would get a Punjab one in return. I made sure I had something from both the teams to keep! 4. Maxwell's practice drill was the most interesting. A member of the Punjab contingent threw some balls at him and he played them straight down. He did that to 3 deliveries and then he proceeded to practice his switch hit / reverse sweep / reverse slog, whatever you want to call it. He must have played two dozen hits, including one that caught the top edge and sailed into the crowd. The crowd started cheering and asking for him to hit them their way, which Maxwell politely obliged. Every single switch hit from then on was hit into the crowd with perfect aim towards a row of people who would catch them. It was probably the most entertaining practice drill I had ever seen. It was also no surprise to see Maxwell hit the same shot off Narine for four as soon as he walked out to bat. 5. Wasim Akram was the first person to walk up to the pitch once it had been rolled and was ready for the KXIP vs KKR match. He knocked a few punches into the surface and then walked over to Gautam Gambhir to have a chat. 6. 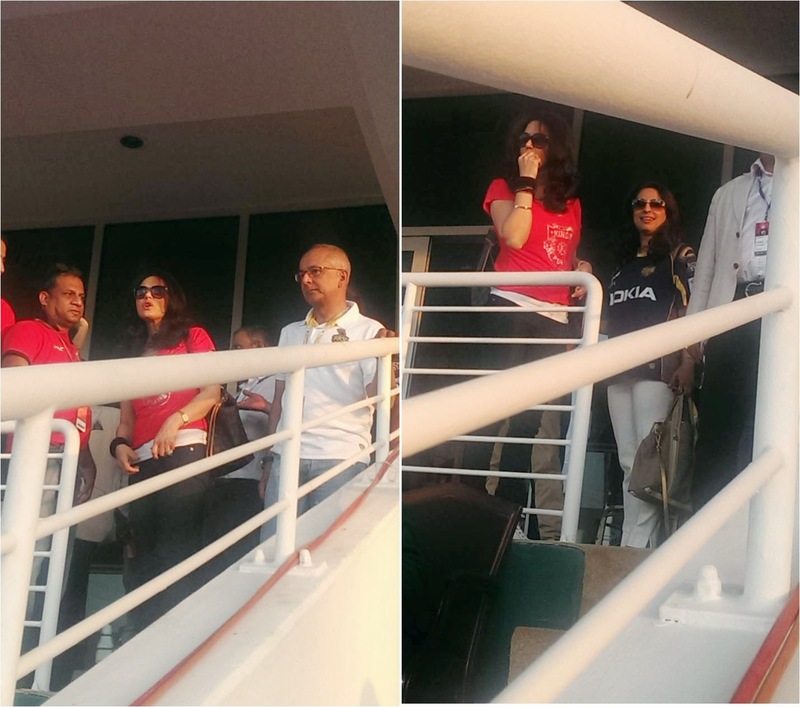 Preity Zinta and Juhi Chawla arrived together to the ground and walked into the Royal Box. Juhi took a seat there while Preity asked for where the Punjab box was. Lucky for me, it was right behind us, next to Mallya's box. 7. The security was tighter this time around Preity Zinta's box and walking up to her to take pictures was impossible, but watching her expressions throughout the match from 10 feet away was more than I could ask for. Having seen all the histrionics on TV for the past 7 years, it was a treat to watch it all from up close. 8. Juhi Chawla has the best smile in the business! 9. Shahrukh Khan arrived during the second half of Punjab's innings. He came with Sheikh Nahyan and sat in the royal box. For the next 3 hours, it was a Shahrukh Khan show. Every Punjab wicket, every boundary hit by KKR was followed by SRK standing on his feet, clapping, waving, and asking the crowd to cheer louder. That man cannot stay away from being center stage. Once again, I ws lucky to be about 10 feet away from him and managed to experience what I have seen all this while on TV in person. The name "Shahrukh" was probably screamed every second during that time as fans tried to get his attention. There was more focus on Shahrukh Khan then there was on the match. 10. At the end of 11 overs, KKR were 50-3 and it seemed that they would reach the target. 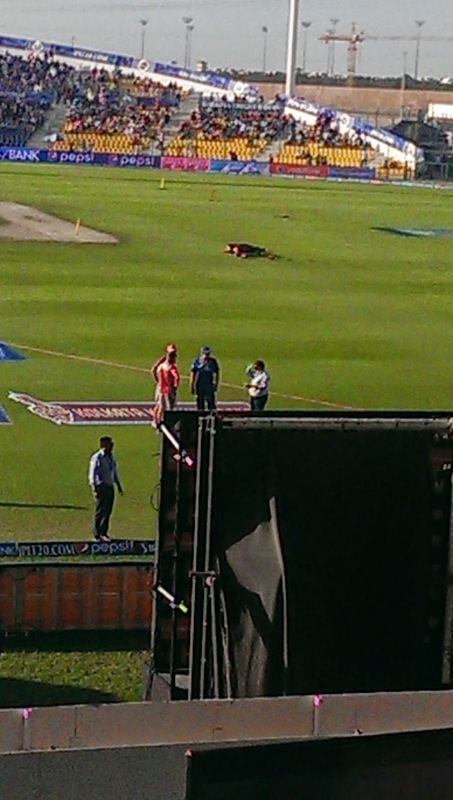 Just then Preity Zinta got up from her seat and walked to the edge of her box to speak to someone. At that same moment, Chris Lynn was clean bowled. Someone from the Punjab contingent asked Preity to stay there and not move till the end of the game. 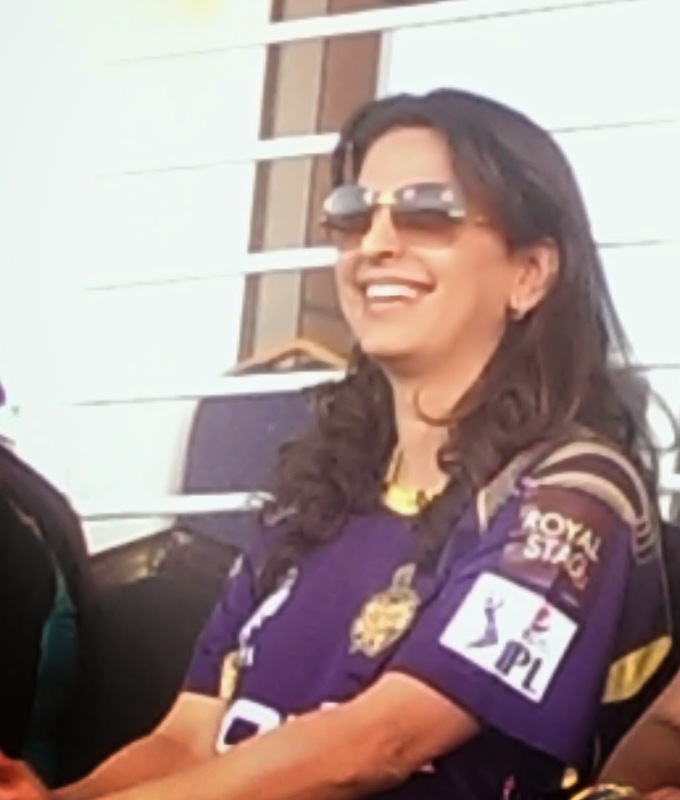 While Preity stood there at the edge of her box, KKR lost 6 wickets in the next 7 overs, and with it the match. The superstition regarding people's positions in the dressing rooms, dugouts, and elsewhere, which is quite common in the Indian dressing room, surely worked for Punjab that day. The cricket was dull and boring, but the entertainment around the ground was top notch.